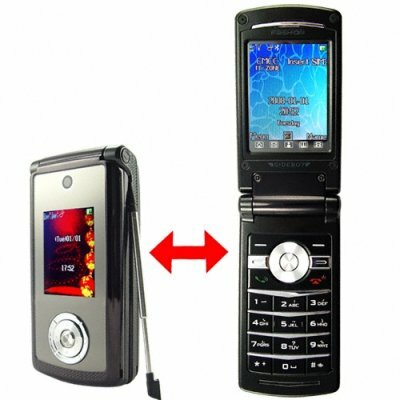 Successfully Added Two Screen Cell Phone - Touch Screen Bluetooth Mediaphone to your Shopping Cart. Dual Band (900MHz, 1800MHz) two screen cellphone with strong media functions including Bluetooth A2DP and AVRCP. This comfortable to hold mobile phone includes a crisp 2.5 inch primary display with a secondary 1.5 inch outer display that is useful for taking pictures of yourself and friends as well as controlling the MP3 player and similar media functions. The outer display also alerts you to the caller ID/user selected display for incoming calls as well as the case of the phone itself lighting up on any incoming calls and messages. Who is this phone good for? Do you need a reasonably priced, stylish media phone? Do you want to own a phone that will visually tell you when a call is coming in and who it is? Then you have found your match! This is also an especially good choice for younger people because of the camera (and screen) placed on the front that allows them to easily take pictures and video of themselves and friends while they are looking at the display. This is a wonderful cell phone for the re-sale and internet storefront market. Offered to you at a low wholesale price from the leader in no M.O.Q. (no minimum order quantity) direct from china electronics, Chinavasion. Slim profile Bluetooth cellphone with two screens and "color-alive" case. This is a take out of the box, easy to use touchscreen dual SIM media phone. E-Book reader has advanced font and scroll control options.